In 2010, we revealed how Beck and other TV talkers hawked for Goldline. Now the company’s execs are charged with fraud. UPDATE: On Nov. 1, 2011, Goldline executives were charged with fraud. Read on to learn why. And check out our other reporting: Consumers tip off the FTC about Goldline, Beck’s counterattack on Rep. Anthony Weiner, the story behind Goldline’s perfect BBB rating, and the left-wing radio hosts who pitch gold. TUNE IN TO GLENN BECK’S Fox News show or his syndicated radio program, and you’ll soon learn about the precarious state of the US dollar, a currency on the verge of collapse due to runaway government spending, a ballooning national debt, and imminent Zimbabwe-style hyperinflation. To defend yourself against the coming financial holocaust, Beck explained on his radio show last November, you need to “think like a German Jew in 1934, maybe 1931.” And that means thinking about buying some gold. For more than a century, gold has held a special allure for conservatives. Amid economic downswings and social upheaval, the precious metal has come to be seen as a moral and political statement as much as an investment. Ever since the late 19th century, when the gold standard became the center of a ferocious debate about the country’s financial future, gold has been mythologized as a bulwark against inflation, federal meddling, and the corrosive effects of progressivism. (See “Goldbug Variations,” below.) In the late 1970s, South African Krugerrands became a refuge from soaring interest rates and oil prices. In the ’90s, militia groups fearful of big banks and the Federal Reserve hoarded gold. Cashing in on all this is a raft of entrepreneurs who have tapped into financial insecurity and fever dreams of impending tyranny. Nearly every major conservative radio host, including Rush Limbaugh, Sean Hannity, Michael Savage, and Dr. Laura Schlessinger has advertised gold. (See “Full Metal Racket,” page 30.) But none has done more to cheer on the new gold rush than Glenn Beck. Beck, whose various media enterprises brought in $32 million last year, according to Forbes, has a particular interest in plugging gold. Since 2008, Goldline has been one of his most reliable sponsors. Last year, after Beck called President Obama a racist, and advertisers bailed on his cable show (see “Lonesome at the Top“), Goldline stuck by him. And its loyalty appears to have paid off. In an email, Goldline’s executive vice president Scott Carter says that while its Beck sponsorship doesn’t bring in the majority of its customers, it “has improved sales,” which exceed $500 million a year. In turn, Beck has stood by Goldline. Last year, he made a promo video in which he stated, “This is a top-notch organization”—a quote featured prominently on Goldline’s website. After the liberal watchdog Media Matters complained about Beck and Goldline’s partnership, Beck posted a video on his site in which he unapologetically noted that he’d started buying from Goldline long before it was his sponsor, back when gold was $300 an ounce. Such coziness between spokesman and sponsor is not uncommon on talk radio, where hosts can be paid to personally recommend just about any product. In fact, liberal hosts such as Ed Schultz and Thom Hartmann have advertised gold. However, their pitches generally have lacked Beck’s tone of apocalyptic urgency. The feedback loop between Beck and Goldline is unusually powerful even for talk radio, and even more so by cable standards. When he’s not talking up Goldline, Beck still hypes gold as a way to weather the coming end of the world as we know it. Last December, he stood in front of his famous chalkboard, where he’d written “Gold, God, Guns,” and admonished viewers, “The smart money is saying, ‘Hunker down! '” The more worked up Beck gets, the more Goldline can employ his fears in pitching its products to his audience. JAMES RICHARDSON heard about Goldline on Beck’s radio show late last year. A disabled former trucker who lives in Tennessee, Richardson called the company with the intention of buying one-ounce gold bullion coins. The purity of American bullion is guaranteed by the Treasury and its prices are transparent, because they’re closely linked to the spot price of gold. But when Richardson got on the phone with Goldline, he says, a sales rep pressured him into buying something entirely different: $10,000 worth of tiny, 20-franc Swiss gold coins. Richardson regretted the purchase almost as soon as he hung up. “I’m not a coin collector,” he says ruefully. The $10,000 represented one-fifth of his entire savings, and after some research he realized that he had vastly overpaid for the francs. The 34 coins he’d ordered from Goldline were 90 percent gold, amounting to about 6.3 ounces of gold, which was then selling at around $950 an ounce. He’d paid the equivalent of around $1,600 an ounce, meaning it could be years before he recouped his investment—if ever. “It was just a lose-lose situation,” he says. Goldline’s marketing and disclosure materials explain that customers buying coins “for investment purposes” may not be able recoup their costs. They also say that first-time customers can cancel an order within seven days of purchase. But Richardson says that when he tried to get his money back within that time period, salespeople gave him the runaround and insisted he should keep the coins because the price of gold was going to double. He filed a complaint with the Los Angeles-area Better Business Bureau (BBB), of which Goldline is a member, and eventually he got a refund. Richardson suspects he’s not the only Goldline customer who didn’t know what he was getting into. “I ain’t got no college degree or nothing, but some of these older people think they’re investing in gold, but you’re not. You’re investing in coins,” he says. The price of gold increased 133 percent between early 2006 and this May, yet many Goldline customers say they have lost money on their purchases after discovering—as Richardson did—that they had badly overpaid. Richardson is one of 44 people across the country who have filed complaints against Goldline with the Los Angeles BBB in the past three years; customers have also have griped about their dealings with the company on message boards such as Ripoff Report and the Pissed Off Consumer. Regulators in Missouri have sanctioned the company for pressuring an elderly couple to liquidate their other investments to buy overpriced coins. The Federal Trade Commission (FTC) received 17 individual complaints about Goldline’s sales tactics between early 2006 and this May, according to information obtained through the Freedom of Information Act. Many of those stories mirror Richardson’s. One customer, whose name was redacted, filed a complaint in February, writing, “Not knowing anything about buying gold, I called Goldline International, Inc. because of their advertisement on Fox News and the fact that Glenn Beck endorses them.” Like Richardson, this customer originally wanted bullion, but the sales rep “absolutely insisted” on 20-franc coins, and the customer relented. Unable to get a refund, the customer reported paying $369 apiece for coins that could be bought elsewhere for as low as $208. A Washington state couple nearing retirement told the FTC they’d invested $31,812 in foreign coins after calling to inquire about gold bullion “as a hedge against the falling dollar.” Once they realized they’d overpaid, they were too late for a refund. Another customer complained that a sales rep “insisted” on selling coins, in this case French francs: “He would not relent. He told me lies.” A quadriplegic Californian described being persuaded to pay $5,000 for $3,000 worth of gold coins after disclosing a recent inheritance to a Goldline rep. I wanted to ask Glenn Beck about these complaints. He never responded, but after I sent his publicist some questions, I received a call from David Cosgrove, a former Missouri securities commissioner and lawyer who represents Goldline. He explained that Goldline is a large operation with 200 salespeople. A few problems, he said, are inevitable, but Goldline works hard to avoid them through compliance monitoring and other safeguards. Undoubtedly, Beck fans who take his financial advice bear responsibility for not reading the fine print. But their trust in the pitchman is an essential part of the symbiotic relationship between host and sponsor that is common on talk radio, where “direct response” advertisers carefully tailor their spots to complement the programming. Toll-free numbers provide instant feedback on how well promotions are faring and allow companies to fine-tune their ad copy on a week-to-week basis. If, for instance, an advertiser sees a surge in calls during a Beck segment focusing on currency collapse, it can play off of his program’s message in an upcoming round of ads. BECK OFTEN SAYS that when he buys gold, he sticks with collectors’ coins instead of bullion because the government is less likely to confiscate them. Like many Americans, you are probably unaware that the Obama administration is plotting to raid your safe-deposit box and melt down your bullion. But Beck insists that we must be on guard against such a scenario, citing a Depression-era executive order that made all gold federal property. In his Goldline promo video, Beck explains, “Back in 1933, FDR said, ‘Okay, we’re going to take all your gold, and [slipping into a Muppet voice] gee, it’s worth—$8 an ounce. '” Beck suggests that some folks “got smart” and claimed their antique coins couldn’t be melted down because they were, well, antiques, and presto! They got to keep their gold. 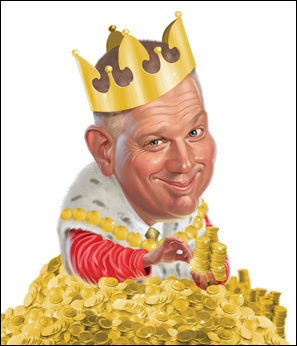 It’s a message Beck has hammered home in other Goldline spots—that in the face of an “out of control” government, collector coins are a safer deal than other kinds of gold. Of course, this is revisionist history. With Congressional authorization, Roosevelt did indeed sign a 1933 executive order that made most private gold ownership illegal, but G-men didn’t go door to door seizing bullion. Instead, the government offered gold owners almost $21 an ounce—the market rate (and not $8, as Beck claims) to turn in their gold voluntarily. Antique and foreign coins were exempt. The move was intended to combat deflation by getting people to stop hoarding wealth that could instead circulate in the economy. The government also temporarily suspended the gold standard so it could adjust the value of the dollar, stabilizing prices, helping debtors, and encouraging more production. Georgetown University history professor Michael Kazin says FDR’s gold policy, which was championed by populists, boosted the economy and in turn contributed to his landslide reelection in 1936. What Goldline doesn’t say in its promotional materials is that for its own bottom line, collector coins are a lot more lucrative than mere bullion. Profits in the coin business are based on “spread,” the difference between the price at which a coin is sold and the price at which the dealer will buy it back. Most coin dealers, including Goldline, will sell a one-ounce bullion coin for about 5 percent more than they’ll buy it back for, a figure that closely tracks the price of an ounce of gold on the commodities markets. That 5 percent spread doesn’t leave a lot of room for profits, much less running dozens of ads a week on national radio and cable programs, with endorsements by everyone from Beck to Mike Huckabee, Fred Thompson, and Dennis Miller. So, Goldline rewards its salespeople for persuading would-be bullion buyers to purchase something with a bigger markup. Twenty-franc Swiss coins are a little smaller than a nickel and contain a little less than two-tenths of an ounce of gold. The coins are about 60 to 110 years old and not especially hard to find (though Goldline describes them as “rare”). They are not fully considered collectors’ items or commodities, making their value more subjective than bullion’s. Goldline sets a 30 to 35 percent “spread” on the coins, meaning that it will pay $375 to buy back coins it’s currently selling for $500. At that rate, gold prices would have to jump by a third just for customers to recoup their investment, never mind making a profit. Investing in Goldline’s 20-franc coins would be like buying a blue-chip stock that lost a third of its value the minute it was purchased. It’s difficult to think of any other investment that loses so much value almost instantly. So what persuades people to buy anyway? About two weeks later, after I’d received my investor kit, the same sales rep called me at work, even though I’d never given him my phone number. Just to double check that Goldline was indeed using caller ID to track potential customers, I called one of its 800 numbers on my cell phone and asked about putting gold into an IRA. I didn’t offer my name or number, but the same sales rep called me back not five minutes after I hung up. Goldline has also tried to keep unhappy customers from making their stories public. Take John Quirindongo, a 77-year-old former New York City postal supervisor. Quirindongo has spent nearly four years trying to get compensation for the money he believes he lost trying to buy platinum bullion from Goldline. When I visited him in Fort Lauderdale, Florida, he was reclining on a sofa, laptop open. A box with two rolls of gold coins sat on a table. His much younger Russian wife flitted around, pouring syrup on a blintz for me before darting off to her job at a children’s clothes store. Quirindongo’s vision is mostly gone. He relies on a walker to get around and a nebulizer to breathe. His hearing is going, he’s missing a couple of bottom teeth, and he gets a little confused sometimes. But when it comes to Goldline, he’s lucid—and very angry. Quirindongo’s saga started in 2006, when a mortgage broker talked him into taking out a $100,000 subprime loan on his condo, which he owned outright. After paying off his car and some bills, Quirindongo decided to invest $70,000 in platinum. He called Goldline and ordered 54 one-ounce platinum American Eagle bullion coins. After the company received his wire transfer but before the sale was confirmed, a salesman called, telling him he needed to “diversify” his portfolio and pushing him to transfer $34,000 into Swiss 20-franc gold coins. Even though Goldline’s disclosure materials do mention that its sales reps may call to “discuss other products which carry a higher spread such as the European gold francs” before an order is finalized, Quirindongo was caught off guard. He says he argued that platinum was a better investment, but eventually caved and bought the francs. Looking on eBay, Quirindongo found similar looking coins selling for far less. He says he called to complain every day for a week, but the Goldline rep insisted he should let his coins gain value for 18 months. Quirindongo missed the weeklong window for a refund and then spent the next year and a half letting his order appreciate. But he was still mad, and in May 2007, he sold the platinum part of his order back to Goldline, making about $219, all of which was eaten up in commissions and storage fees. The real shock came a few months later, when he tried to sell back his gold coins and discovered the buy-back price would leave him more than $10,000 in the hole. After Quirindongo complained to the American Numismatic Association, of which Goldline is a member, the company offered a partial refund, so long as he signed an agreement promising not to speak publicly or contact any consumer or government agencies. Quirindongo refused. After he rejected a full refund, Goldline tried to close the matter by sending him his gold coins, which now sit partly unwrapped in his apartment. There has been one successful state action against Goldline. In 2006, the children of an octogenarian Missouri woman complained to the state securities commissioner that Goldline had persuaded their mother to invest about $230,000 in gold coins and antique paper currency worth half as much. The state determined that a Goldline salesperson had acted as an unlicensed investment advisor when he encouraged her to liquidate an annuity to buy coins. Goldline agreed to refund $217,000 to the woman. Cosgrove, who represented Goldline in the Missouri case, cautioned me not to see it as representative of the company as a whole. He said the salesperson who prompted the complaints had already left the company by the time Goldline learned about the problem.